Slide Out Cover Replacement Fabric | ShadeMaker Products Corp. Replace your A&E Dometic or Carefree SlideOut Cover Fabric with one of our HEAVY DUTY Replacement Fabrics. Our Slide Out Cover Replacement Fabric is made from heavy duty 18 oz. white vinyl which is heavier than OEM (Original Equipment Manufacture) This Fabric has a much tighter weave coated with molten vinyl instead of laminated between two sheets of vinyl. As a result this fabric withstands wind and tearing forces better than the original fabric, cannot de-laminate is UV resistant, Mildew Resistant and Easily cleaned. Limited 30 month manufacture's warranty to the original purchaser. This fabric handles slide outs with up to 42" projection (47.5" bead to bead distance). We can also make them for shorter projections. 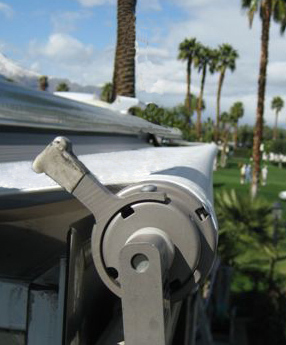 Most slide out awnings have a roller tube with either a 5/32 or 3/16 slot. Included comes interchangeable polyethylene rope/bead to fit either size roller tube slot and 1/4" rope/bead installed in the awning rail end. Our slide out replacement fabrics Will not fit slide out covers with metal weather guard! (shields fabric when rolled up). Made in USA by ShadeMaker Products Corp.